Rustic, simple, and quite sweet, the historical candied ginger is as wonderful straight as it is added to tea. The texture appears to be quite hard, but dissolves and crumbles nicely in the mouth. 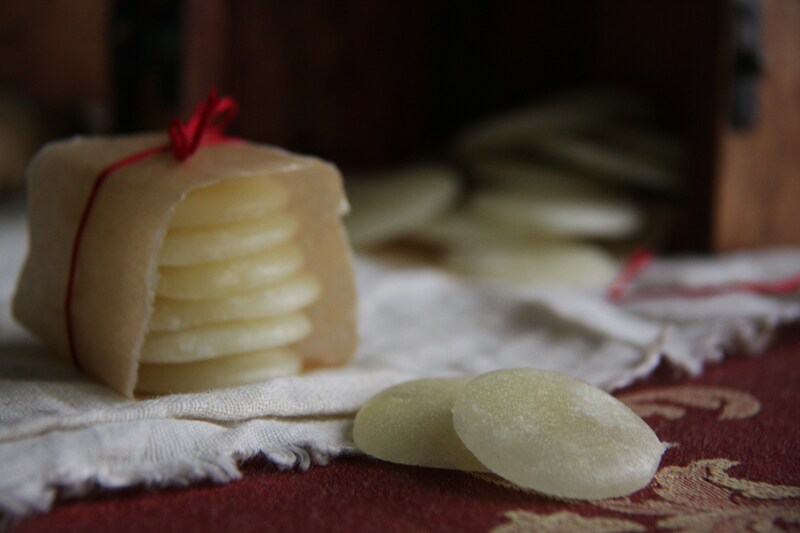 Despite the relatively small amount of ginger, the finished Georgian candies have a wonderful zip to them, without the same overpowering ginger as actual slices. Quite their opposite, the modern recipe produces candied ginger that will set one’s mouth on fire. They are the more easily recognizable candied ginger that one can find in many stores, but I’ve never encountered any with this much bite. Personally, I preferred the more mild gingeriness of the older recipe, although true ginger fans will love the modern. Cook’s Note: I’ve halved the original recipe. It will still make a large batch of candies, approximately 30-40 candy discs. Boil half the sugar in just a splash of water, with the grated ginger. When it comes to a boil, add the other half of the sugar. Stir until the whole mixture thickens. You may need to add the whole 1/4 cup of water to maintain a smooth, spoonable texture. After about 3-4 minutes, remove from heat, and spoon the mixture into small rounds on your prepared baking sheet. Spray a cooling rack with nonstick spray and set it in a half sheet pan lined with parchment. Peel the ginger root and slice into rounds about 1/8″ thick. Put these and the water into a saucepan, and cook over medium-high heat for around 20-30 minutes, or until the ginger is tender. Keep an eye on the water level. To this same pan, add the sugar, turn the heat down to medium, and continue to cook. After about 5 minutes, turn off the heat. Fish out the ginger slices, allowing the excess syrup to drip off. Toss these with fresh sugar until they are coated, and place on the cooling rack to harden. Once completely cool, store in an airtight container for up to 2 weeks. Save the syrup, as it is a wonderful addition to cocktails and tea. I love ginger. Nothing warms you up like a nice hot ginger tea, but my favorite has to be candied ginger. Sweet with a bit of a hot spice taste. I must admit Ive never tried the historical version but it sounds sweet. thanks guys. I made candied ginger last Christmas because I was making some fruitcakes (and my dear husband got fresh ginger at the store, rather than the requested candied ginger because ‘it was so much cheaper’) I boiled mine in simple syrup and the ginger-infused simple syrup is amazing. It goes great with a bit of whiskey and ice – we’ve dubbed it an Irish Shipwreck! I made the Historical Georgian Candied Ginger yesterday and have let them sit up to dry overnight. The ginger taste is elegant and subtle, but the candies are grainy and not a ‘smooth, melt in your mouth’ feel. Guess I didn’t let the sugar mixture cook long enough. It is very dry here at 7,000 feet altitude and I used the entire 1/4 cup water…maybe I needed more water with a longer cook time; but was afraid of diluting the flavors. BUT, as I said, the ginger flavor is fantastic! Duh, that’s SET up to dry…they don’t have enough ginger in them to make them SIT up…the little guys are just relaxing on the parchment paper! Not sure what an earthen dish is but sounds like unglazed pottery. I tried them twice today. The first time I used ground ginger. Those did not work out at all. The second time I just used the required amount in fresh ginger, chopped it roughly and put it in the sugar. I boiled it with the rest and when done I took it out again. The second try came out much better than the first. They do kinda look like those on the pic, while the first ones were just brown things. And they just have a light taste of ginger. I like that. I really really love ginger, has anyone tried making the Gregorian one with twice the ginger for more zip? I made them with twice the ginger, very sharp indeed. I finally tried the Gregorian ones today – and they are awesome. I used about a tablespoon per disk, but next time I’ll probably do just a teaspoon. I want a one-bite candy, not a two-bite candy. I tried to use one of the ugly ones in a dark and stormy cocktail, but the sugar didn’t dissolve fast enough and was just weird. I don’t recommend it, but into a cup of lemon tea I think it would be nice. I used as much ginger as I had in the freezer, which was probably about 2-3x as much as the recipe called for. I freeze ginger that is going to be grated because it is a lot easier to peel and then grate. I wouldn’t do that for the modern candies, though. Once the ginger thaws out, it changes texture as you would imagine. I can’t seem to get the recipe to work. I get the first 1/2lb to boil, but when I add the 2nd 1/2lb, it doesn’t seem to thicken, then suddenly goes super-grainy and turns into a lumpy mess. Is this supposed to be over low heat, medium heat, high heat? Do you have any more detailed instructions from doing this yourself? I’m hopelessly lost and I REALLY want to try this! 1. Medium heat does it. 2. DO NOT wait 3-4 minutes after it thickens. Once it thickens (which may take 3-4 minutes) start dolloping it out right away. Otherwise it gets overcooked (which is why I was failing so miserably). I made the old recipe twice one with about twice the ginger in the recipe because nom. First batch turned out crumbly and ith a subtle zing, second batch I tried for the proper hard candy (and got it) and I must say the caramel-y taste of the longer/higher cooking time really works fantastically with the finger and actually tastes a bit more rustic imo.